Writing is central to my artistic process. 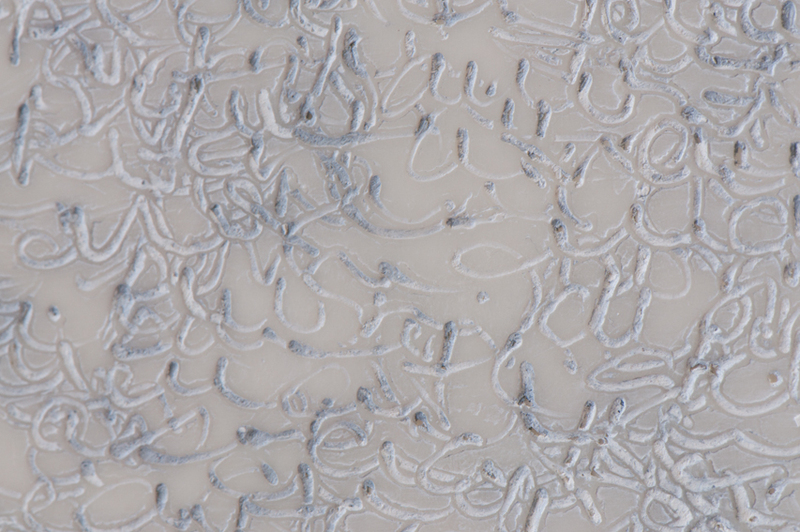 I inscribe texts directly in the encaustic using a prescribed method and limited means. The meaning of these texts is ultimately sacrificed by the adding and subtracting of the layers of wax: the re-inscriptions and the deletions. This process allows me to transcend the limits of alteration and saturation while creating expressive and sensitive surfaces where the content, at first textual, becomes illegible. In these palimpsests, the writings are transformed and become traces of depositories of silence. It is a subdued silence, full of contradictions since it originates from reflections that are never really communicated. The paradox of writing an idea about the non-read and the non-communicated interests me. During this long and tedious ritual, a tribute to slowness, I explore and think about different expressions of silence: its rarity due to the constant chatter of the city and its contamination by inner dialogues. This constant interference is a kind of investigation of the thinking process and the complexity of consciousness. It makes reference to our interiority.